I love a great beanie. And really, who doesn’t? 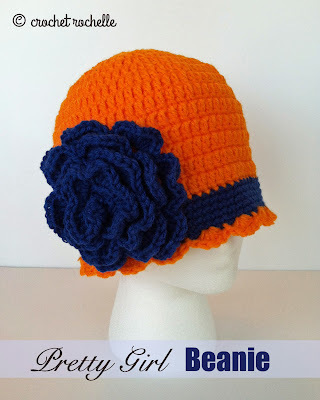 For me a great beanie is easy to crochet, versatile and wearable. Since I have two active little boys and an outdoorsy husband, we go through the beanies like crazy. But I don’t often get the chance to make pretty beanies since I am the only girl in the house – and we crocheters seldom make stuff for ourselves. Am I right? After I posted the Pretty Baby Beanie, I received lots of positive feedback and plenty of oohs and ahhs on Facebook and a few on Ravelry too! Upon special request from a child hood friend who saw the baby version on Facebook, I created a larger version of the original pattern with instructions for making sizes 6 months to Adult! 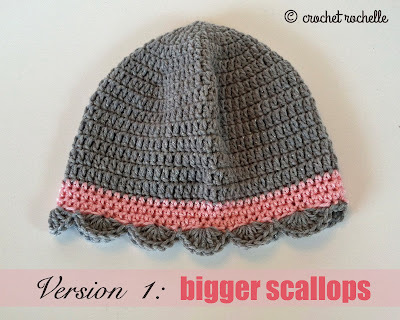 I also included two alternate ways to finish off the band and scallop edging of the beanie. The 1st one creates a looser fit and larger scallops. 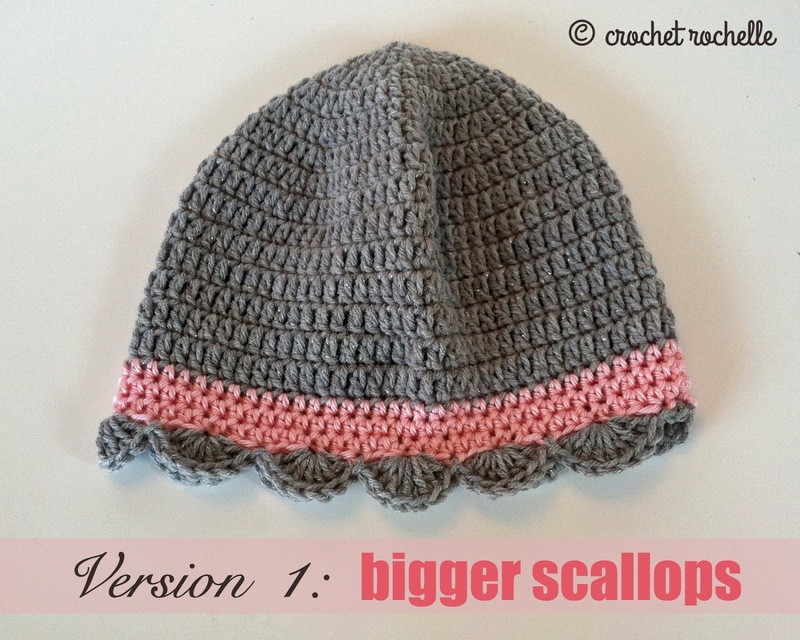 The 2nd version creates a tighter fit and smaller scallops – both are easy and adorable! Here’s my version of a simple beanie that is easy to crochet and so pretty to wear or share! I hope you enjoy it. As always, should you have any questions about this pattern (or find any errors) – please email me, message me on Ravelry or comment on this post. If you like this beanie, you can find the Pretty Baby Beanie here. It's for size 0 - 3 months. Start your first stitch of each round in the same space as your chain/s. Rnd 1: Magic Ring, dc 10, join. Rnd 7 – 8: Repeat Rnd 6. Proceed to desired finish version. Rnd 8 – 9: Repeat Rnd 7. Rnd 8 – 10: Repeat Rnd 7. Rnd 9 – 12: Repeat Rnd 8. Rnd 9 – 13: Repeat Rnd 8. Rnd 10 – 14: Repeat Rnd 9. Rnd 10 – 15: Repeat Rnd 9. 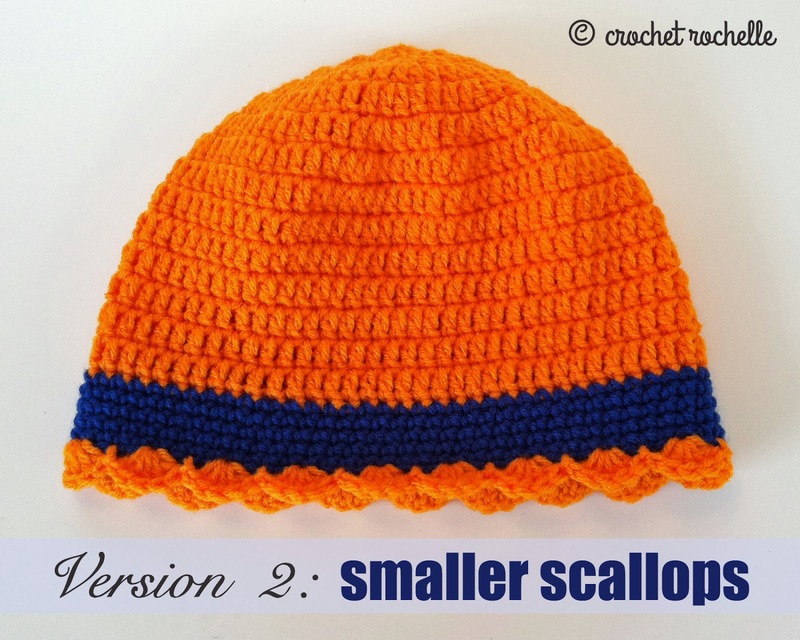 This version creates a looser band fit around the forehead and a larger scallop. 3 Rnds of: Ch 2, HDC around, join. 1 Rnd of: Ch 1, skip next 2 sts, 7 DC in next st, skip next 2 sts, [sl st in next, skip 2, 7 DC in next, skip 2] repeat around. SC in last sp, join. 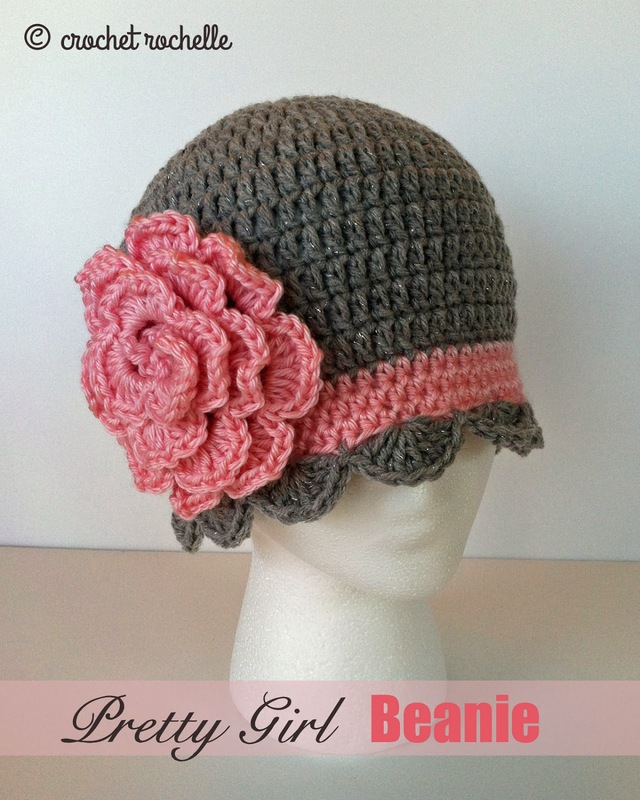 This version creates a tighter band fit around the forehead and a smaller scallop. 4 Rnds of: Ch 1, SC around, join. 1 Rnd of: Ch 1, skip next st, 5 DC in next st, skip next st, [sl st in next, skip 1, 5 DC in next, skip 1] repeat around. SC in last sp, join. You could also use buttons, silk flowers, fabric flowers, ribbons or other fun accents to adorn this sweet beanie. Be creative! 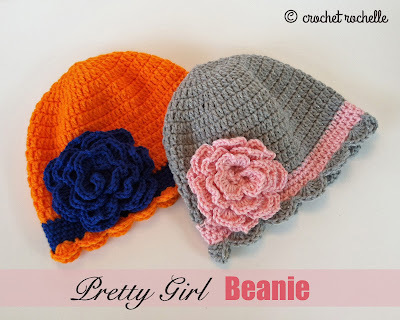 And here I am modeling the Pretty Girl Beanie! your flower looks larger then the pattern i located. did you add a row ? Hope this helps! Thanks for commenting! I was wondering how many skein's of yarn of each color you need for the medium-adult sized hats? Thanks in advance!! Hi Heather, I am sorry to have responded so late...I just saw this comment. I used about half a skein of Red Heart for main body and (maybe) a 1/4 for the band and flower. (Less than a whole skein for the entire hat.) Hope this helps. Okay I am on round 4 (Toddler / Preschool size 3T / 4T) and I'm not sure what I am doing wrong. I'm not sure how I'm supposed to end up with (40 DC) at the end because if I do 2 dc in each space, I end up with (60 DC). Could you help me figure this out? =) And also, are you counting the chain 2 as one of those DCs? Thanks!! I love the pattern BTW!! I am stuck on round 4 for the child. What did you do to get 40 and not 60? Are you suppose to decrease? Thanks for your help. You put 2 DC in the same stitch, and then for the next two stitches you only put one per stich, then 2 and then 1 in the next two. Hope that makes sense. And no, you don't count the chain 2 as a stich. Oh never mind! I just realized what I was doing wrong! lol. I just finished the toddler sized hat but it doesn't look right. It's wide enough to fit my husband's head... I followed the instructions exactly as it was written but I'm wondering, for rows 8-10, it says repeat row 7... But should I be skipping any stitches so that I still end up with (60 DC) in the end? Because I feel like that is where the hat should get smaller but mine just gets bigger. Please help! Thanks! Hi Megan, You can find my 0 - 3 month size here - http://www.crochetrochelle.com/2013/10/pretty-baby-beanie.html. Hope this helps. Okay I am also on round 4 (child) and I'm not sure what I am doing wrong. I'm not sure how I'm supposed to end up with 40 DC at the end because if I do 2 dc in each space, I end up with 60 DC too. Could you help me figure this out? So in Round 4, chain 2, work 2 double crochets in your first space, then work 1 double crochet in next space, then another double crochet in the third space. do this all the way around. It "should" give you 40 dc's total. I hope this helps. Please let me know if you still need some support. I don't crochet! Can I purchase a hat? If you would like to purchase a hat, please would you send me a quick email to tiardavis@gmail.com and tell me a bit about the size, color, when you would like it and where you live. I am a girl from Denmark. I am making this hat for a newborn, I don´t want it to be to small so maybe 3 month old would be best. I have a problem with the size. My hat is very small. We don´t have Caron Simply Soft yarn here, so I had to guess what kind you used from looking at the picture. I must have used a thinner yarn. So I think I should make the teen hat, and then maybe get the right size. It would be very helpfull if you could please give me the measurement across that I should have before doing the "dc around", and the the length from the top down to where I should change color? Can you tell me what size hook did you use for the large adult hat. Btw love the pattern. Hi! I usually use an H or I hook for the large adult hat. It kind of depends on who I am making it for. If I am making it for a customer or special order I'll use an H just to make sure the fabric is a bit tighter to start with. The fabric will stretch with wear but I want the hat to last as long as possible and hold up under washing and drying. If I am making this hat for myself or a friend, sometimes I use an I hook, especially since I like a looser fit and more drape to the fabric personally. Great question! I hope you'll give the pattern a go! I absolutely loved this pattern! Your instructions were super clear, I really like the way you did your joins and things worked up beautifully. My only comment is that I made the 12-24 month size hat first (yes I checked gauge, and I was right on) and it was wayyyyyyy too small for my 14 month old (whose head was 65th percentile at her last check up so she's not crazy big or anything). I made a second hat in the child size and that one fits great! So thank you very much for a beautiful pattern but fair warning, at least for my kid, it ran way small. Ami, thank you for the comments and warning about size! I will have to revisit the pattern and sizing - perhaps the sizes need a little tweaking! Thank you for sharing this pattern. Going to make an adult version for use after chemo! Hi! I LOVE this pattern! I am newish to crocheting in the round. Could you clarify for me what you mean in the notes, chains do not count as stitches in this pattern? When completing a round do I just skip over the chain I made at the beginning of the round? Thank you!! Hi! Yes, exactly. Skip over the chains you make at the beginning of the round when joining the last stitch to the first stitch to complete the round. So instead of joining your last stitch to the 2nd chain from beginning of round, you would join to the first dc of the round. Does that help? Thanks for the comment & great question. Gorgeous pattern! 💜 thank you! 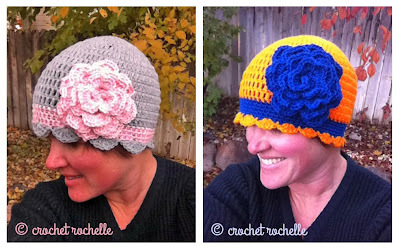 Hi, I think this is the cutest hat pattern...love the big flower, but at what row do you change the color to make the band? Thanks!! I am new to crocheting and it seems everytime I try to do a beanie I get something that looks like a huge drink coaster .....please help , I follow the pattern , even go to you tube for tutorials but still the same , what am I doing !!!!! I loved the look of this hat, I currently have plans to make like 10 for friends and family. My only problem is is that during my scallops I'm near the end, just did a slip st and only have e spaces left. That's too few for another scallop but too many for the directions. I've gone back a few times to count and make sure, and nothing's wrong. Making the adult medium heat, sc band, and large scallops. Oh dear. I'd have to go back and rework this pattern to remember if I ran into this issue (it's been a really long time since I made one of these.) I would try squeezing a small scallop in if at all possible and try to blend it. The giant flower would go a long way toward hiding a tiny change at the end of the round/join. If you are talking about the crocodile flower - I would follow the link where you will find a really nice tutorial from B Hooked with images to help guide you. Really cute pattern! Thank you so much for sharing. I want to make it with a bulky yarn that I have, just wondering if anything in the pattern would change and if I should use a larger hook size? Thanks in advance! Krista - thanks! Not sure if you are still wondering about bulky yarn and hook size. I would first decide what size you are making and then using a size chart (like this one: http://www.crochetrochelle.com/2013/10/head-size-chart.html) determine the circumference. For a woman's size small the final round would measure 20" - that means you'll need to figure out how many dc's/inch will result from bulky yarn and the appropriate hook. Once you know your gauge, you can follow the pattern's repeating structure and it "should" come out nicely. Let me know how it turns out. I just made one adult lady size today followed the medium adult size pattern. The design is AWESOME. I have substituted the single crochet rows with half double crochet in the third loop. The end result is as cute. Thank you so much for this simple yet elegant design.